11 Ways to Spot an Alcoholic: Be Alert and Save a Life! Alcohol abuse is similar to other disorders. The earlier you spot its symptoms, the sooner you can seek professional treatment for your alcoholic spouse, helping him to rebuild his earlier productive and healthy lifestyle. Often, an alcoholic does not have the physical ability or mental clarity to recognize the signs of alcoholism himself. Some people might also try to hide their alcoholic behavior. The charge is on you to learn how to spot an alcoholic and save a life. Not all alcoholics turn up at offices or parties in an obviously “drunk” state – mumbling irrationally or staggering unsteadily. And neither do all alcoholics sport disheveled looks. That someone has become a staunch addict or that he is abusing beer or any other alcohol might not be obvious at a first glance. Nevertheless, you would want to learn how to spot an alcoholic face for the benefit of a loved one whom you want to encourage lead a healthy, fruitful, and drug-free life. Can alcoholism cause mood swings? How to spot an alcoholic? 11 ways to spot an alcoholic with ease. It’s true that alcoholism can cause mood swings. In fact, mood swings are some of the common behaviors of an alcoholic withdrawal. An alcohol abuser can sometimes have unprovoked mood swings during the onset of the withdrawal symptoms, even though they do not usually suffer from mood disorders. Flushed aspect characterized by the reddening of the face and other skin areas. Uncontrollable shaking movement of the hands or trembling of other body parts. Reddish rashes on the skin or red blotches on the skin that show up when drinking alcohol. Unaccounted absences from work, diminished productivity, the abandonment of household chores by an otherwise competent individual are signs that the person probably doesn’t have the mental ability or physical capacity to perform his or her customary duties. Drinking in perilous situations like while or before driving or mixing alcohol with prescription medication or illicit drugs such as cocaine or heroin despite being aware of the risks are signs that the person is disposed to take risks to drink. This indicates that the individual is conscious of the fact that his or her drinking habits are abnormal or troublesome and is trying to hide or play them down. Eventually, they end up drinking alone to hide the problem. Alcohol withdrawal manifestations are unpleasant. This unpleasantness forces a person to keep on drinking despite the fact that he or she is aware of the harmful symptoms of alcoholism and intents to quit. For many alcoholics, these manifestations start within a few hours of drinking the last alcoholic beverage. If an individual NEEDS to drink in the morning or HAS to slip away during the day to drink secretly (even when he or she are at work), it is a suggestive sign of alcoholism. They would rather keep out of sight and drink a few than go through the withdrawal manifestations. If you’re wondering how to spot an alcoholic at work, just look after these signs. A sudden change in alcohol tolerance is a revealing sign of on-going alcohol addiction or chronic alcohol abuse. The individual not only drinks more but also displays the symptoms of being inebriated long after the majority of his or her drinking companions. His or her body has gotten used to drinking alcohol in large quantities. This is an easy example of how to spot an alcoholic female that tries to hide her addiction. This indicates that the individual might have developed a psychological addiction to alcohol and feels “obliged” to drink. Alcohol has become his or her way of de-stressing, and without it, the person cannot calm down. Neglected tasks, dishonesty or secretive behavior, and financial distress take a toll on relationships. If an individual is not able to quit alcohol in the interest of restoring harmony in relationships, it becomes obvious that he or she places alcohol above their loved ones. Unfortunately, the presence of this alcoholic behavior when not drinking is fairly common. 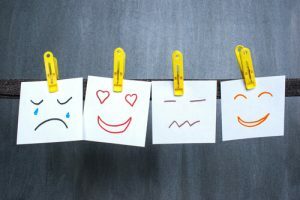 Unexpected and unaccounted mood swings in a normally tempered person, or someone who doesn’t suffer from mood swings might signal the beginning of the withdrawal symptoms. 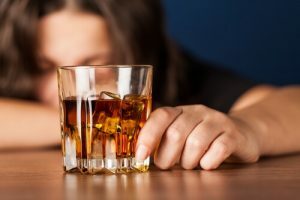 If a person displays alcohol withdrawal symptoms, it is plausible that he or she has been indulging in alcohol consumption for quite some time. Alcoholic thinking forces the person to obsess over trying to get drunk, which can lead to mood swings. This means that your loved one has had one too many. If there are several similar episodes, you can assume with certainty that he or she often engages in binge drinking. Binge drinking is a behavioral drinking problem, and it’s usually helpful when you’re wondering how to spot a functioning addict. However, binge drinking can lead to alcohol poisoning. To be certain you know how to spot alcohol poisoning, you should look for symptoms like cold or clammy skin, hypothermia, vomiting, lack of physical coordination, and mental confusion or disorientation. If not even the frequent clashes with the law on charges of disorderly conduct, violent behavior, or drunken driving can keep a person from consuming alcohol, you can be certain that he or she values alcohol over life, security and safety, and normal social behavior. It is also plausible that the person who manifests the abusive alcoholic behavior consumes so much alcohol that it clouds his or her mind. Trembling hands, red or blotchy skin and a flushed appearance are the typical physical signs of alcoholism. The previously mentioned symptoms of alcoholism might not show up together. Some signs might not manifest at all. So if you see a loved one exhibiting unusual drinking behavior that is often landing him or her in trouble, try to find professional medical treatment for alcoholism. When these signs show up, you can be certain that alcohol has already begun to affect the body and the mind of the person. Your vigilance, appreciation, and swift action in reducing alcohol tolerance can save a life. Even if an addict has some conditions that do not let him enroll in the rehab for alcoholics for a long period, there is an outpatient treatment for alcoholism. AlcoRehab » What is Alcoholism? A Complete Guide to Alcohol Addiction » 11 Ways to Spot an Alcoholic: Be Alert and Save a Life!